Discover the Highlands and Islands in 2016 with Go Scotland Tours. We will be continuing to offer a wide range of tours throughout Scotland for all types of travellers. All tours include a local tourist guide passionate about Scotland. Join one of our regular scheduled group departures or customize your own private tour of Scotland. Keep up to date on tour offers in Scotland with the Go Scotland Tours Newsletter. We will let you know new tours being offered from all different types of themes in all parts of Scotland. Very often we will have specials that we post on our Facebook Page,Twitter, and Blog. So make sure to follow if you haven’t already! The holiday season is approaching and Go Scotland Tours will be celebrating in style. This year we are offering Christmas tours to the Highlands and New Years in Inverness and Edinburgh. These and more will be coming soon. If you have any enquires for these or any other tour please contact us for more details. £13 adult, £11 concession . This tour is not suitable for children. The year of 2015 has officially rolled in and Go Scotland Tours is continuing to come up with new ways to discover Scotland. We are looking forward to another year of meeting new friends to explore Scotland with. Catering to every type of traveller we aim to please a wide audience looking to be guided around Scotland. We will continue to provide a range of regular tours from 1 to 17 days, and also arrange private tailor made tours. You will now find these popular private tours on the website. Pick up available from Edinburgh, Glasgow, Inverness, Aberdeen and the cruise ship ports…. New for 2015 we have some scheduled tours available from the cruise ship ports of Greenock, Invergordon and South Queensferry. And as always you can hire a private driver guide to escape the crowds of the cruise ships. If you can’t find what you are looking for make sure to contact us to assist you. Season greeting from Go Scotland Tours! It is hard to believe the year is almost coming to an end. It has been a wonderful year meeting so many new friends, showing them the delight of Scotland. We do hope some of you are in Edinburgh at New Years to enjoy the Hogmany Celebrations (New Years Scottish Style). The year of 2014 is set to launch many events throughout Scotland: Homecoming Scotland, Battle of Bannockburn 700th Anniversary, Commonwealth Games in Glasgow, Ryder Cup… this mixed with the annual festivals including the Highland Games, Edinburgh Festival and Military Tattoo has made Scotland ranked as THE place to visit in 2014. Make sure not to be the only person in your circle of friends to say they have never been to Scotland. Keep up to date on tour offers in Scotland with the Go Scotand Tours Newsletter. We will let you know new tours being offered from all different types of themes in all parts of Scotland. Very often we will have specials that we post on our Facebook Page, Twitter, and Blog. So make sure to follow if you haven’t already! Go Ireland Tours Newsletter. Come on a tour to discover Ireland. Explore the emerald isle’s stunning landscape, historic castles, towns and cities while embracing its culture and charming people. 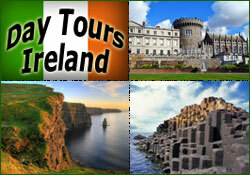 Make Ireland your tour destination for 2014. Start your Irish tour from Belfast. Visit the Titanic Experience a brand new attraction opened in 2012 with 9 different galleries from the 1900s beginning in Belfast, through her construction, to her voyage and disaster. While on your tour of Northern Ireland drive along the Antrim Coast, and walk in the foot steps of a local giant at the Giant’s Causeway. Dublin offers a wide range of day excursions and multi-day tours exploring the all of Ireland. Day tours to West Ireland and the Cliffs of Moher, or go on a tour to Southern Ireland to visit Cork and Blarney Castle. Dramatic sea cliffs to ancient monasteries and castles. Take a Celtic Heritage Day Trip to Boyne Valley for a unique Celtic experience. Take a city walking tour around Dublin with a local guide to make sure you dont miss Dublin’s most popular icons, from Trinity College to Dublin Castle. Tours are also offered from West Ireland in Galway. Discover the dramatic beauty of Connemara with its rugged wilderness, welcoming locals and historic treasures. Killarney has a selection of day trips. You can explore the awe inspiring Ring of Kerry, an unspoilt nature to Ireland’s most beautiful region. Excursions to the Dingle Peninsula area also available as well as a half day tour to explore Killarney itself. For a limited time we are offering a discounted price for the 4 day tour to Islay departing on March 28. The regular price is £525 we are offering it for £475 for this departure date. That is a £50 saving! Seats are limited so make sure to book before they are all gone. This tour takes you away to a Scottish island paradise. Stunning scenery, ancient history, traditional culture and 8 of Scotland’s finest whisky distilleries… what more can you ask for? Find out more about what makes Islay whiskies so special, you will visit a number of the island’s distilleries and take a guided tour. There will, of course, be an opportunity to sample the whisky during these visits, as well as tastings at some distilleries. We at Go Scotland Tours pride ourselves on providing a professional and enjoyable experience. All the guides we provide for these services are qualified by the Scottish Tourist Guide Association. Put on your walking shoes and discover historic Scotland. Explore places you would not see on a coach tour; see behind the buildings, the closes and under the pavement! Go Scotland Tours offers a unique experience with guided walks of Edinburgh’s Old Town, New Town and Underground Vaults. Visit the Edinburgh Underground Vaults. Witness the unaltered conditions in which real people lived, the notorious bodysnatchers. Historic Tour Edinburgh.. Historical walking tour of the premier street in Edinburgh Georgian New Town access to the finest interior features of some of George Streets famous building.